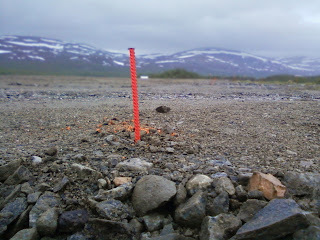 With the High-Band Array (HBA) field finally level, it is time to start work on the survey for the antennas themselves. The HBA tiles are actually 5×5 metre squares, which are spaced in a regular grid comprising a few sections (6×4, 6×2 and 6×2). Overall, however, the tile grid is regular, and the gaps are also 'tile sized'. Because there needs to be a small gap between tiles for water run-off, fittings, anchors and so on, the actual 'grid increment' is 5.148 metres exactly. So the field is then marked out according to this. A number of reference marks were taken first. 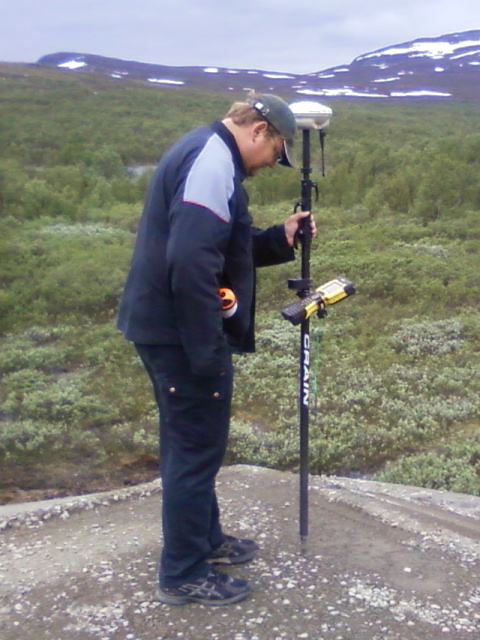 From these the precise direction to the EISCAT VHF transmitter in Tromsø was calculated (azimuth = 314.1762 degrees). The original corner reference mark was then checked with a multi-satellite receiver system (top left photograph) and the field corners were measured. At this point a slight correction was applied to optimally centre the array on the field (which helps with issues such as possible erosion and access). With the new reference mark, the corners were re-calculated with the correct azimuth. Then all the intervening grid points were calculated. In addition to this, four triangulation points were measured. These then served as the calibration points for the surveyors total station, which was used to do the final mark out. Once the corners have been measured, small metal pegs are driven into the ground to mark their locations. These are quite fine! 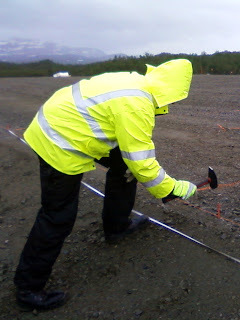 Additionally, checks are made to ensure that the spacing is correct and that the grid is properly set out. It is certainly interesting to see all the pegs in place. It happened very quickly (the work was completed in about 24 hours). With the pegs in place, additional layout work can now start. This is for marking the location of the cable-tunnels and the position of the cable mausoleum. More on that later.